"The entire staff their treats their clients with respect and they know exactly what they're doing. They are there when it comes to costs and will not exploit anyone under any given circumstances. Seriously who would ever say that about a lawyer? My first experience will always be remembered as my best. Thank you Kelly and everyone involved." "We worked with Rebecca Zeilenga to finish up our adoption case. She was quick on her feet and fierce in the court room. She was understanding, confident, and sincere. Everything is laid out in the contracts and invoices, so there were no surprises or questions on charges. Definitely recommend Becky!" "John Anderson has represented myself and my company for over 12 years. Over those years, John and his team have successfully defended and litigated for us on many different levels. We can proudly maintain that we are undefeated to date. His representation has included victories in Federal Court for Trademark Infringement, Local Divorce, General liability, Corporate disputes and several personal matters." "Jon has been my family&apos;s attorney for over 10 years. He was our attorney for the sale and purchase of both our homes. He was very knowledgeable and kept us informed on every aspect of the sale and purchase. I would not hesitate to recommend Jon to any of my friends or family for their legal needs." Whether you are planning to end your marriage through divorce or need to resolve legal issues related to children, the attorneys of Anderson and Associates, P.C. can provide you with the guidance and advocacy you need. With more than 30 years of experience assisting clients in a wide variety of family law cases, we can ensure that your rights are protected throughout the legal process while working to help you achieve a positive outcome. Our compassionate attorneys will make sure you understand your rights and options, work with you to help you meet your legal obligations, and aggressively advocate for your family&apos;s best interests in court. Contact our Orland Park law office at 708-226-9904 to schedule a free consultation. Divorce - We help spouses reach settlements regarding the division of marital property and maintenance/alimony and assist with modification of divorce decrees. Child Issues - We work with parents to resolve disputes over parental responsibility, parenting time, child support, and child removal, and we assist with adoption, paternity, and grandparents&apos; rights. Alternative Dispute Resolution - We help spouses reach a mutually beneficial resolution to their divorce disputes through mediation or collaborative law. Marriage and Divorce Planning - We work with couples to create valid, enforceable prenuptial agreements, postnuptial agreements, and cohabitation agreements. Contact our Orland Park divorce lawyers for legal help resolving issues related to the equitable division of marital property (including real estate and investments), spousal maintenance (alimony), hidden assets, business valuation, tax implications, and post-divorce modification and enforcement. Call 708-226-9904 to schedule a free consultation. Our Tinley Park family law attorneys assist with the allocation of parental responsibility (child custody), parenting time (visitation), child support, child removal/relocation, adoption, guardianship, paternity/parentage, grandparents&apos; rights, civil unions, and orders of protection. Contact us at 708-226-9904 for a free consultation. Illinois law was updated in 2017, changing the guidelines used to determine parents&apos; financial obligations to support their children. Contact our Cook County family law attorneys at 708-226-9904 for help calculating the correct amount of child support payments based on both parents&apos; net incomes and amount of overnight parenting time. Estate Planning - Creating wills, trusts, and powers of attorney, resolving matters related to contested estates, providing representation during probate litigation, and working to address elder law issues. Bankruptcy - Helping families file for Chapter 7 or Chapter 13 bankruptcy and negotiating with creditors to avoid foreclosure. 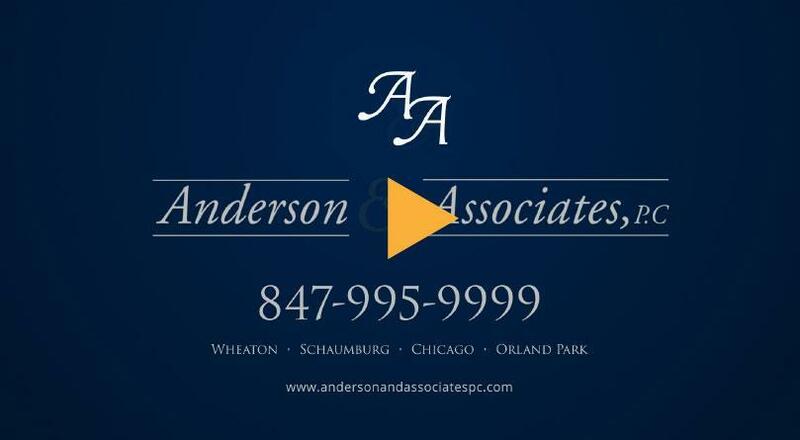 Attorney Jonathan Anderson, the owner and founder of Anderson and Associates, P.C., has worked for over 30 years to provide quality legal services to clients throughout the greater Chicago area. With his experience litigating divorce cases involving complex financial valuations, hidden assets, and contentious child custody disputes, you can rest assured that you will have a skilled legal advocate on your side. Jon Anderson is proud to be listed as a Leading Lawyer, an honor which is awarded to less than five percent of the attorneys in each state, based on recommendations from their colleagues. This recognition demonstrates that Anderson and Associates, P.C. can provide quality legal services to clients who need assistance with family law, estate planning, or bankruptcy. Our attorneys can help you make sure your wishes are carried out correctly after your death, ensure that you have the financial resources you need near the end of your life, and provide representation when resolving issues related to contested estates. If you are struggling with overwhelming debt, we can help you understand your options for discharging debts through Chapter 7 or Chapter 13 bankruptcy and negotiate with creditors to reach debt settlements and avoid foreclosure of your home. Whether you need legal help with divorce, family law, adoption, paternity, estate planning, or bankruptcy, the skilled, dedicated attorneys of Anderson and Associates, P.C. can help you understand your rights and options, work with you to meet your legal requirements, and advocate for you through negotiations or litigation. Contact our Cook County law office today at 708-226-9904 to schedule a free initial consultation. We serve clients in Orland Park, Tinley Park, Mokena, Homer Glen, Palos Heights, Oak Forest, and throughout Cook County and Will County. ▶ What Does Allocation of Parental Responsibility Mean? ▶ Will I Have To Pay My Spouse Maintenance And How Much? ▶ Where Can I File For Divorce? ▶ I Have Been Named the Executor of a Will What Next?